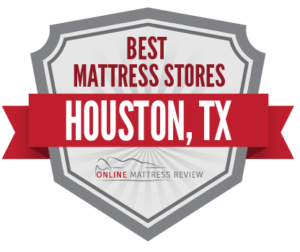 Looking for a mattress store near you in Houston? Whether you’re looking for a great discount or just the most comfortable mattress for your needs, this list narrows down the best mattress shops in Houston so that you can go in search of the best bang for your mattress buck. Houston is a vast city and is growing every day. Whether a transplant, student, or local you’ll need a convenient way to get a quality and affordable mattress. If you’re working or studying in Houston, you understand the value of a great night of sleep. We spend more time in our best than in our cars. Well, most of us do. Finding the perfect mattress is the game-changer when it comes to making the most of the waking hours. With Mattress Firm’s Headquarters located just South of Houston, you will not be hard-pressed to find a mattress shop near you. Mattress Firm is not the only spot that has great quality mattresses. We have combed through your home city and found some of the top rated mattress shops in town. Check out the mattresses we have listed in our state guide or find them by region below. We wanted to show you the best options for making a purchase in downtown Houston, so we have selected a few spots that are near Houston. If you’re wondering: “Where can I find a mattress store near downtown, Houston?” You have come to the right place. Texas Mattress Makers (4619 Navigation Blvd) is right near downtown Houston in the Second Ward. They make quality mattresses and are full of knowledge. You will actually find yourself looking forward to mattress shopping when you work with Texas Mattress Makers. Mattress Firm Midtown (2625 Louisiana St.) is a great mattress store near downtown. They offer competitive pricing, and trusted customer service. Just a little farther West in Midtown you will find Mattress Firm Final Markdown (208 Westheimer Rd.) for great discounts. If you’re shopping on a budget, definitely try Mattress Firm Final Markdown. Mattress Firm supplies most of the mattresses in and near Houston. Their corporate office is located just South of Houston. You will find a Mattress Firm Memorial Park (3902 Koehler St.), Mattress Firm Final Markdown (1005 Westheimer Rd.) in Montrose, a Mattress Firm Neartown West (2071 Westheimer Rd) and a Mattress Firm Rice Blvd. (2428 Rice Blvd.). If you are looking for convenient, predictable and affordable, Mattress Firm is a great place to shop. Sleep Number (5819 Kirby Drive) is located near Rice University and is the perfect location for students and locals alike. If you are looking for a quality mattress that won’t keep you tossing and turning, try Sleep Number. Gallery Furniture (2411 Post Oak Blvd.) offers high quality furniture made in America. You will find some incredible mattresses that offer you a truly deep night’s sleep. To go with it, you may want to try one of their bed frames. The customer service at Gallery Furniture is outstanding and delivery is timely. For points South, rest assured we have got you covered. Mattress Firm Clearance (9878 Buffalo Speedway) offers reliable and affordable mattresses. You’ll also find memory foam and adjustable mattresses. Mattress 1 One South Loop (1211 S. Loop W.) is known for brand-name mattresses, pillows and bases. You will find exactly what you need for great affordable prices. The sales clerks are friendly and knowledgeable and go the extra mile to ensure that you get a mattress that fits you and your budget. Conn’s HomePlus is located all across Houston and sells a number of great mattresses and bed sets. If you are looking for brand-names you can trust, excellent customer service and shipping policies, look no further than Conn’s HomePlus. Houston appears to be stretching out these days. Well in Texas there is plenty of room to grow which is why we wanted to make sure we included some of the surrounding areas too! Mattress Overstock is located near Houston but further North by Cypress. If you are looking for a great deal on a mattress, Mattress Overstock (17776 Tomball Pkwy) has got you covered. Mattresses For Less (20610 Gulf Fwy) in Webster offers quality products, quality customer service, and mattresses that are a great fit for you and your budget. With such a vast selection to choose from there is something for everyone here. Value Furniture Pasadena (Bayshore Plaza) offers a number of great mattresses for adult and kids including some of the top brands. The staff is knowledgeable and friendly and their delivery process is straightforward and reliable.